When we visited NZXT at CES this year, we expected more of the same from the company. Cases, power supplies, fans, case accessories, etc. The usual, if you will. But imagine our surprise when we went to their suite to find none of that. Instead, their suite was completely empty save a single product – a new toy NZXT calls the DOKO, a PC streaming device that promises to bring the PC into the living room at a fraction of the cost of an actual PC. Equipped with a Wonder Media 8750 CPU and 256MB of RAM, the DOKO is capable of streaming 1080p content at 30FPS. 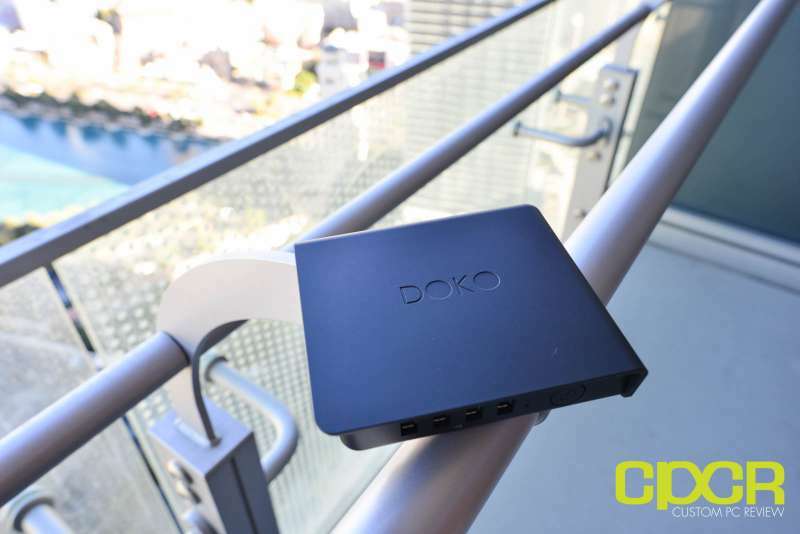 Simply install the software on your PC, hook up the DOKO streaming box to your TV and internet, connect the PC to the DOKO, and you’re ready to go. It’s practically plug-and-play. When running, the DOKO can be controlled through keyboard, mice, gamepad, etc. attached to its 4 USB ports or directly to the host PC. Since the DOKO simply relays the output of the PC to the TV, its use is not limited to just gaming – it’s also perfectly capable as a movie streaming device and even can be used as a living room productivity center. Of course, there are a couple limitations with the device. In order to retain a consistent, predictable user experience, the NZXT DOKO only works via a wired Ethernet connection. Depending on how wired your house is, this may or may not be a problem. Additionally, there is around 50-80ms latency. This may limit gamers to more casual, less competitive games where split second actions aren’t as important. At the NZXT suite, we briefly tested Metal Gear Solid V: Ground Zeros single player, which felt perfectly playable however, I’d probably stay away from any multiplayer games. The NZXT Doko is available now for $99.99 via the NZXT website. With other devices such as the Razer Forge TV just on the horizon however, it’ll be interesting to see how the DOKO pans out.